Depending on your business policies, you may have elected to allow staff to enter their own Leave requests. They can do this through the Employee App or My Tanda. You can send staff this article on Leave if they need help. Once a day Tanda sends a time off digest email. This email will detail any new or updated leave requests or unavailability entries. Managers and Admins can also enter Leave directly into Tanda, either for themselves or on behalf of staff. Employees can also request leave themselves using the Tanda App. This can be enabled or disabled in your organisation settings. 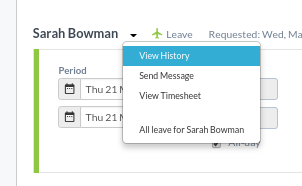 Leave can be accessed on the Timesheet by clicking on the plane icon at the end of shift rows. Check out the Timesheets: Leave article for more information. Select from the drop-down box the relevant Employee. Select the start and end date. If you weekend should not be included in their Leave and you're entering say 2 weeks, it's best to enter two leave requests; one for one week and another for the second week. Select the Type of Leave. If you can't see a Leave type for the relevant employee, check the heading at the bottom under Common Issues. Next, you can optionally enter a Team for the Leave, add a Document and a Reason. When you're finished, just click the green Submit Leave Request button and the Leave will automatically be approved and appear in the Approved tab. Leave requests entered by an employee will come through to the Pending tab. You can either Approve or Decline the leave by pressing the relevant button in the bottom right corner. Alternatively, if it was entered by accident you can delete it by pressing Delete Request in the top right corner. 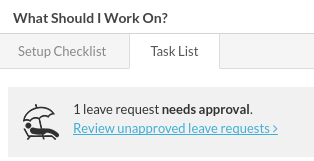 Before approving, you can still edit the Leave request by clicking in the relevant fields to update if needed. Edit the leave by Admins & Managers until it is exported to your Payroll software. 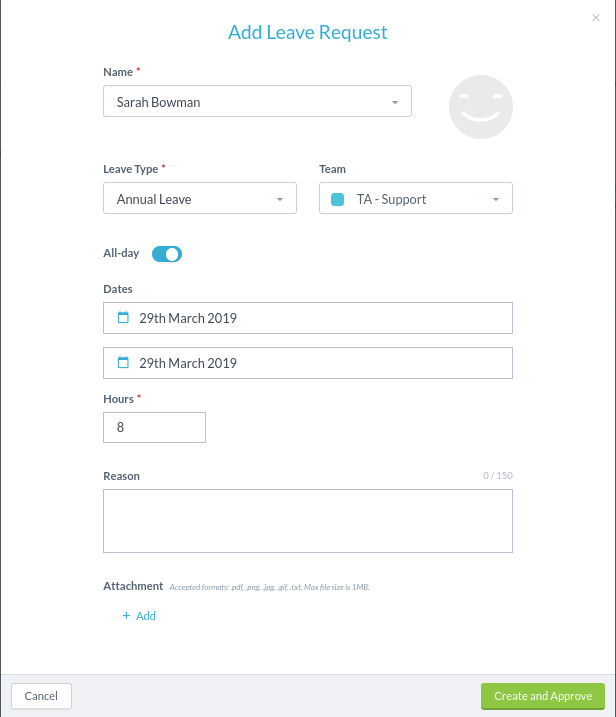 It will show in grey to show it is locked at which time you'll have to unlock the Timesheet to make a change or make the changes straight to your Payroll system. Attach a document if the employee didn't originally attach one to the request. You can still Decline/Delete by clicking the relevant button just above the request, at the right far end. If you press Decline either in Pending or Approved Leave tabs, you will be prompted to include a reason to include in the email notification to the employee. You can also opt not to send an email to the employee (this can be useful if the leave was entered by a Manager incorrectly and the employee doesn't need to be notified). Click the red Decline leave request button to action. You can also click Cancel at the bottom if this was in error. Once you've actioned the request, it will show under the Declined tab. Once the Leave is declined, you won't be able to edit or bring it back. If there are any changes that allows you to approve the leave, you need to enter the details again in another request. View Leave types: this is a shortcut to Payroll > Leave Types where your Leave setup is configured. Leave Balances: Allows you to download the leave balances or import it here in Tanda through an excel format. Once you've added and approved Leave, it will then show as approved on Timesheets ready to be exported to your Payroll system. 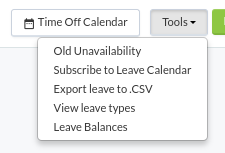 You can check how Leave shows on Timesheets by looking at the following article and that you have set it up correctly by checking out the Payroll Configuration: Leave article. Under Applies to, check which classification of staff are eligible for the Leave. If you're missing one, click on the Name of the Leave to edit under Applies to, select the missing classification, i.e Full Time, Part Time, Salaried. Then go back into the Leave request and you should be able to select the employee.